William Morley, considered one of the early British builders, is believed to have started his business in 1843. Morley's cameras are meticulously crafted and beautifully finished. This particular camera is a fine example of a quarter plate wetplate tailboard view. It is built from a richly finished mahogany wood, brass trimmed, and fitted with a maroon leather bellows. A Ross lens is mounted. Morley must have been extremely concerned with detail and quality during all phases of construction. All major wood parts (including the wetplate holder) have matching construction "lot marks." When cleaning the lens elements of dust, I discovered that Morley even engraved the same construction lot mark on the inner brass barrel. This indicates that the lens is probably original to the camera. 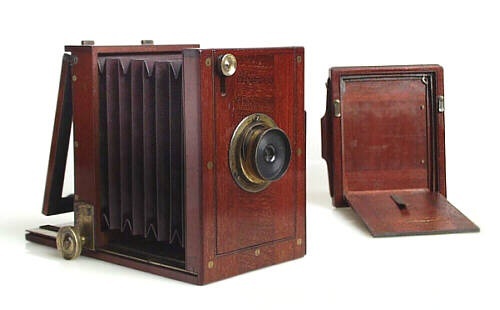 The Morley camera is very small, measuring only 6-1/2" high x 4-1/4" wide x 8" long. The "outrigger" support is an unusual construction detail for a camera of this size. knob and rare, original wetplate holder.